BERLIN, Jan. 11 (Xinhua) -- The trial over the theft of a 100-kilogram gold coin from Berlin's Bode Museum started on Thursday in a Berlin district court, with the four suspects denying all accusations against them, according to the German Press Agency (dpa). 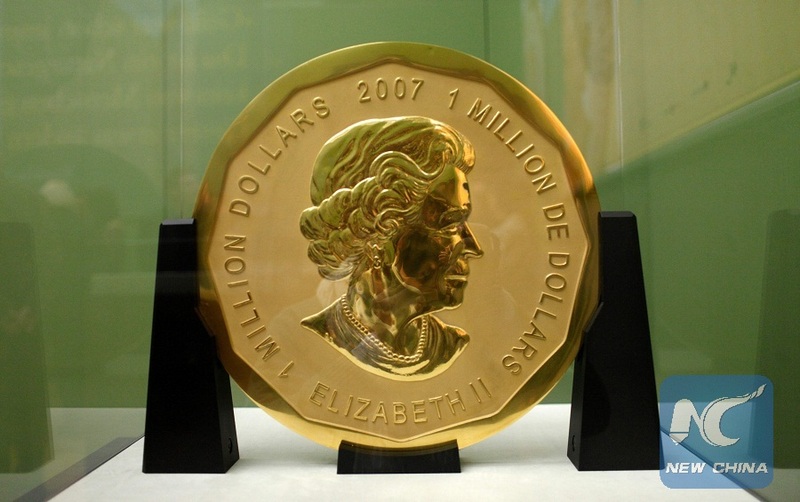 The large gold coin, called the Big Maple Leaf and valued at 3.75 million euros (4.3 million U.S. dollars), was stolen during the night of March 27, 2017. Police suspect that the coin was melted down and sold. To date it has not been recovered. Three of the defendants with German citizenship have been accused of stealing the coin, while another suspect, who worked as a guard at the museum, is believed to have acted as an inside man. Local media said the three suspects stealing the coin were brothers connected to a criminal group. The prosecutor charged that the three defendants had broken into the museum, stolen the heavy gold plate and transported it away on the high-level tracks of the Berlin S-Bahn trains. The act is considered a serious theft, with maximum possible sentence of 10 years in prison. Questions remained to be answered as to why the breaking of the window did not trigger an alarm in the museum and why the destruction of the showcase was not heard by any security guard. The Bode Museum is located on Berlin's Museum Island, which is one of German capital's UNESCO World Heritage Sites.